If you, like us, have stuck two very stiff fingers up to the wintry weather and have continued to cycle everywhere, this one is for you. Obviously we applaud your bravery to pedal along the icy, dark roads, but we urge you to make sure you'll always be seen. 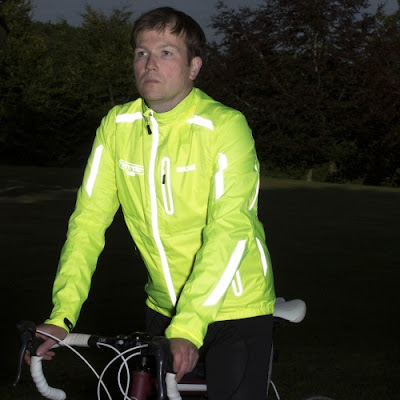 We've checked out other cycling gear from Proviz before, and also their insanely reflective REFLECT360 Jacket, but none have been quite so eye-catching and attention grabbing than the Proviz Nightrider LED Cycling Jacket. High vis jackets like this, perfect for cyclists, runners, and pedestrians, usually employ a bright yellow or pink day-glow colour, coupled with reflective stripes. That's a good combo, one we've relied upon ourselves in the past while on our bikes. However, day-glow only really works in the day (hence the name), and reflective stripes only work when light is shining on them. So, if you're in the dark at night, without light hitting you, you'll be completely unseen. 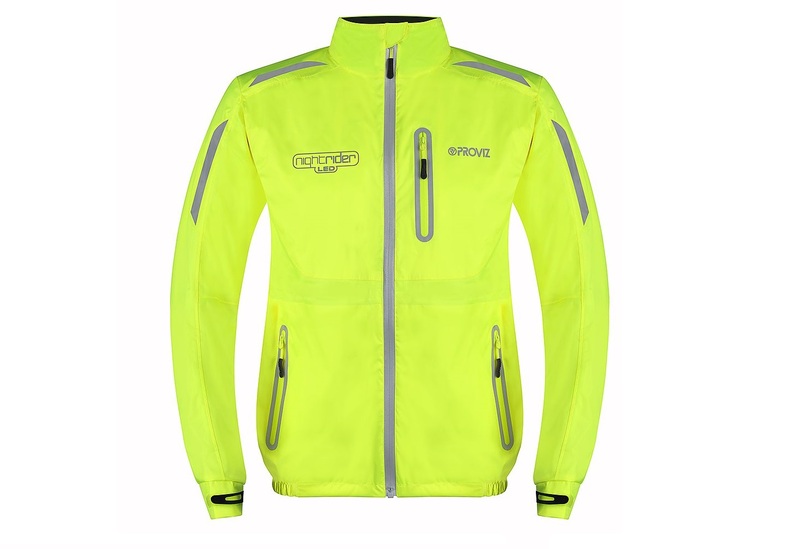 Enter Proviz with their Nightrider LED Cycling Jacket; a day-glow yellow jacket with reflective stripes... and a lot more. 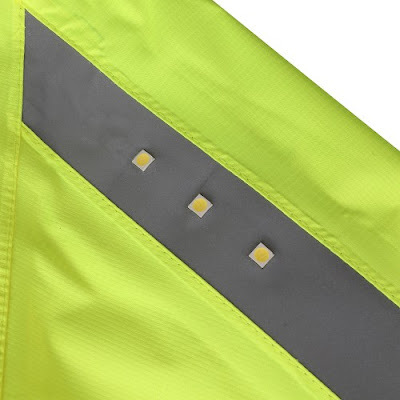 You see, built into the actual waterproof fabric of the jacket are rows of LED lights which are connected to a removable, rechargeable battery pack. 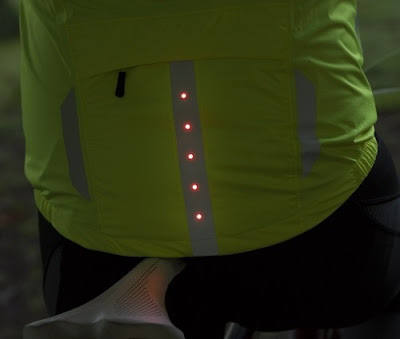 When activated, the strips of white lights along both arms, and the strip of red lights on the lower back, shine intensely bright. Like, seriously bright. The wiring for the lights lives between the outer layer of polyester, and the inner layer of soft cotton mesh. The battery pack, which can be recharged with a micro USB cable and also features the on/off button, lives in a little pocket on the inside right side. Press a spot on the outside of the jacket and the lights will spring to life. This means you don't have to unzip anything or fiddle about to bring the lights on - just press an easily accessible spot on the jacket. The brightness of the lights is very impressive, especially considering the fact that they are so very flat and subtle. When we first received the jacket, we assumed we had been sent an ordinary one, as we didn't notice the lights. But the minute we put it on and hit the button... holy crap did we notice! The lights can be set to shine continuously, blink, or blink very quickly. Whatever you choose, you will be seen, and actually you'll attract far more attention than you would ordinarily on your bike, even with bright and flashing lights. 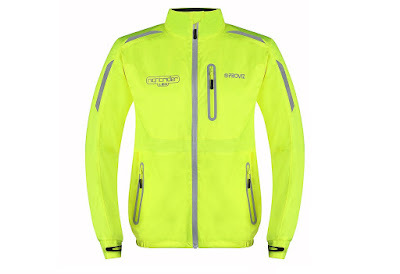 The Proviz Nightrider LED Cycling Jacket is, therefore, the most high-vis of high-vis jackets we'd ever worn. 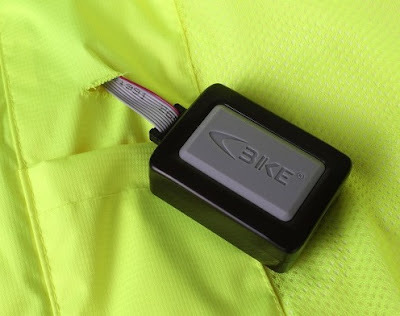 However, Proviz say that that the Nightrider LED has been given a snugger cut that previous jackets, and that is our only complaint. We received a large size from them, as that was the same as the REFLECT360 we'd previously tested. That one fitted very well as an over-jacket, allowing a few layers to be worn underneath it, making it perfect for cold winter weather. The Proviz Nightrider LED Cycling Jacket, however, could only really accommodate a t-shirt or base layer - nothing thicker. It is a bit of a shame, as the jacket needs to be the outer most layer you wear on your bike, obviously. We really wished they'd cut it slightly roomier. That said, a bike ride on even the coldest of days can get you pretty warm, so if you ride hard, you won't notice the chill. And, to combat overheating, there are vents on the back of the jacket, and zip-openings under the arms. We also really love the micro fleece lining around the collar, because, when it's cold, you will zip the waterproof zip right up to the top. So, the Proviz Nightrider LED Cycling Jacket is the brightest, highest-vis, most attention-grabbing item of clothing we've ever tested. For this time of year, and any time of the year at night, this is a must-buy.